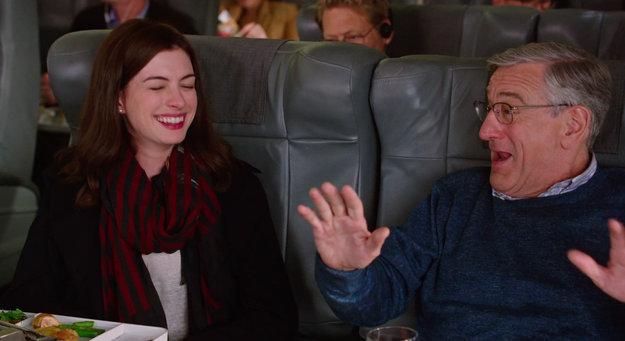 The Intern is a sweet and enjoyable little comedy, like most Nancy Meyers films. I loved the concept – a culture/generation clash between old and young – and the casting of Robert de Niro and Anne Hathaway is perfect. 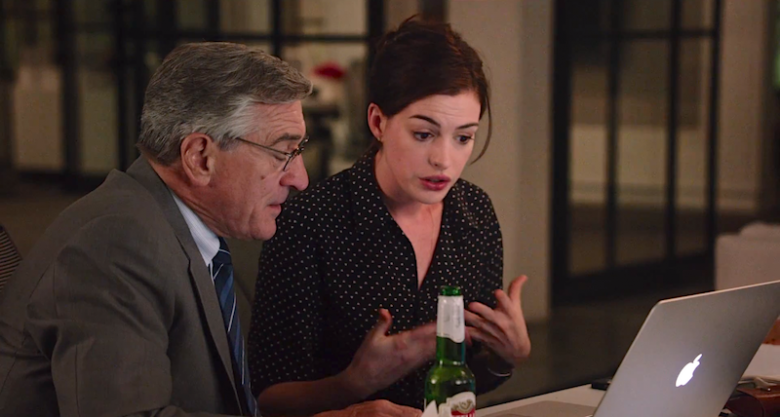 De Niro is Ben, a 70-year-old who has no purpose in life since he retired and his wife died, so he signs up for a senior internship program at About the Fit, a start-up e-commerce website that was created by Jules, played by Hathaway. She is reluctant to have him as another assistant as she is already overwhelmed by work, her work/life balance and the possibility of a seasoned CEO coming in to take her place. But over time, she and Ben become good friends and he helps her through all her problems, including trouble with her husband Matt (Anders Holm). The main comedy here comes from comparing De Niro’s generation to mine, who have grown up with technology and aren’t so great with actual face-to-face conversation. Ben wears suits and acts like a gentleman, the guys wear hoodies and don’t know how to talk to girls, for example. Ben is very sweet and understanding and Jules eventually comes to him for advice and wisdom, as he used to work at a successful phone book company in his day. I found it fascinating to see how the fashion office is run. Those were my favourite scenes because I’m so intrigued by it, the setting looked amazing, and it feels weird seeing Hathaway in the boss role after playing the assistant in The Devil Wears Prada. 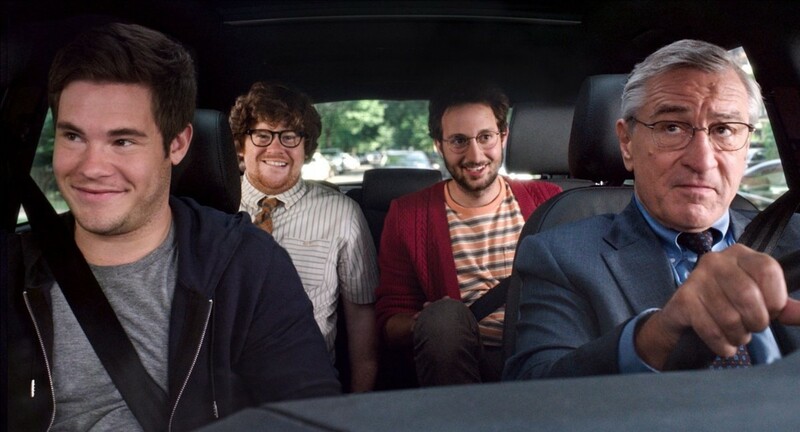 The banter between the office boys – played by Adam Devine, Zack Pearlman and Jason Orley – is brilliant and they become great friends with Ben. I found one of the main themes to be what the young can learn from the old, and vice versa. The main, main theme however is about working women balancing being mothers and wives too. I felt like this was hammered home a bit too much- especially as Jules suffers a troubled marriage and she blames it on her work. There are also a lot of comments from mothers at her daughter’s school that just highlight the double standard between working women and men. I loved the script and I did laugh out loud quite a few times. Sadly though, most of the best bits are in the trailer. There isn’t a huge plot, and it is pretty fluffy stuff but it was so refreshing to see a relationship between a man and woman which isn’t romantic/sexual. The blossoming friendship between Ben and Jules is heart-warming and so nice to watch. I found myself smiling the entire way through.